Click on the article name to go directly to the article, or click on the icon to see a description. This article was published in the C/C++ Users Journal, May 2001 issue. You can download the code presented with the article directly here. This article presents a C++ implementation of an FIR Digital Filters Library. The main focus of the article is the implementation, not the mathematical foundation and details about digital signals and DSP techniques. If you are not familiar with signal analysis and DSP theory, you can study the DSP reference shown at the end of the article , or any other books on DSP or Digital Filters. This article was published in the C/C++ Users Journal, November 1999 issue. This article was published in the C/C++ Users Journal September 2000 issue. Click here to download the source code presented with the article. Published in the C/C++ Users Journal in a two-part format (November 1998 and December 1998 issues). This article presents a C++ Implementation of standard tools in the field of Computational Geometry. You can download the code presented with the article here. 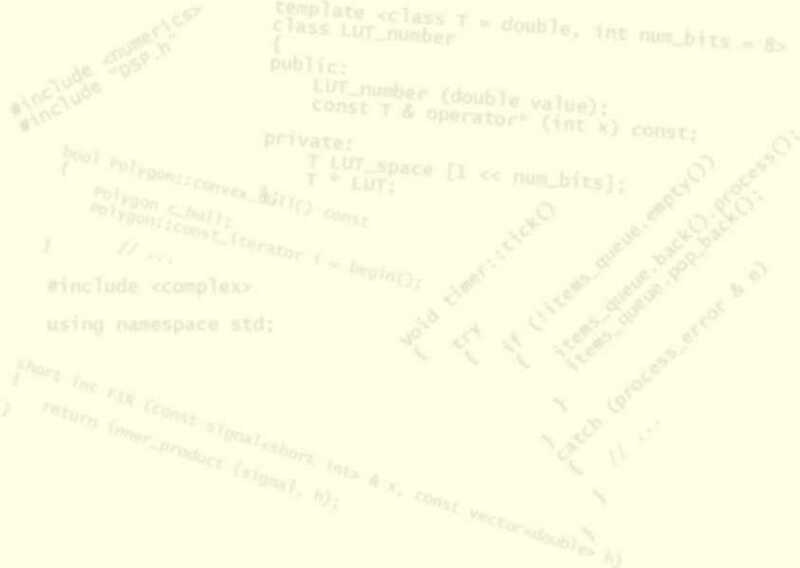 In this article, I present an implementation in C++ of LUT operations. I first present a definition and properties of Look-Up Tables, with examples of use. I then show the implementation details of the classes to represent LUT's that perform floating-point multiplications and function evaluations. A discussion on when to use LUTs is also presented in the article. This article presents the design, implementation and field tests of an on-board system to detect, in real-time, the driving pattern of a drowsy driver. The detection is based on driving parameters such as the movements of the steering wheel, speed of the vehicle, etc. The system acquires the data and processes it in real-time, to extract spectral information, which provides key information to detect the driver drowsiness state.